You've found the “U.S. 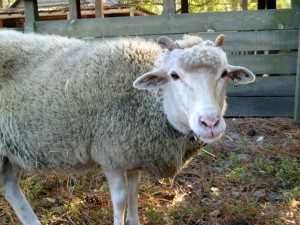 Gulf Coast Native Sheep Breeders” page here at Hobby Farm Wisdom! If this is the first time you have visited our site: Welcome! Also known as Gulf Coast sheep, Woods sheep, and Native sheep; they descend from the Spanish flocks brought to the New World in the 1500s. Gulf Coast Natives are extremely rare small fine-boned sheep, with ewes weighing around 180 lbs and rams 200. Both sexes may be polled or horned. Though primarily a meat breed, Gulf Coast Natives carry light wool that may have some hair in it, with a staple of 2.5-4 inches long. It is usually white, but it can also be brown, black, or spotted. All Gulf Coast sheep do not have wool on their faces, bellies or legs, which is an adaptation to the heat of the South. Their most notable characteristic is their resistance to parasites and disease that flourish among sheep in hot humid climates. They can adapt to an environment that is generally difficult for sheep. Gulf Coast breed and lamb year-round.